The Farm Science Review is Sept. 20-22 this year and will offer farmers and other visitors to the annual farm show the opportunity to learn the latest agricultural innovations from experts from the College of Food, Agricultural, and Environmental Sciences at The Ohio State University. That includes offering some 180 educational presentations and opportunities presented by educators, specialists and faculty from Ohio State University Extension and the Ohio Agricultural Research and Development Center, which are the outreach and research arms, respectively, of the college. Purdue University educators will also present, said Matt Sullivan, assistant manager of the Farm Science Review, which is located at the Molly Caren Agricultural Center in London, Ohio. “Visitors to FSR will be able to learn new techniques and strategies to improve their farming operations’ bottom line,” Sullivan said. “Right now is a challenging time in agriculture with low commodity prices, so farmers and producers of all sizes will be able to come and learn about new programs and ideas to improve their farming operations. Following the theme “My FSR,” visitors will be able to experience the show with a more personalized perspective, Sullivan said. “The goal this year it to invite people to see the Farm Science Review through new innovations and take part in educational programing that offers information on what they are looking for,” he said. “This event is now in its 54th year. It has become a place that people want to be a part of because we offer ideas from farming to conservation and everything in between, and people can experience it in their own way. This is just a sampling of what participants can expect to see during the three-day farm trade show, which is nationally recognized as a premier agricultural event. FSR annually draws between 110,000 and 130,000 farmers, growers, producers and agricultural enthusiasts from across the U.S. and Canada. Field to Faucet water and nutrient research tours. Participants can learn more about the joint projects between Ohio State and Beck’s Hybrids, featuring research on water quality and nutrients, nutrient use efficiency for nitrogen and phosphorus, precision agriculture and compaction, and high yield factors. 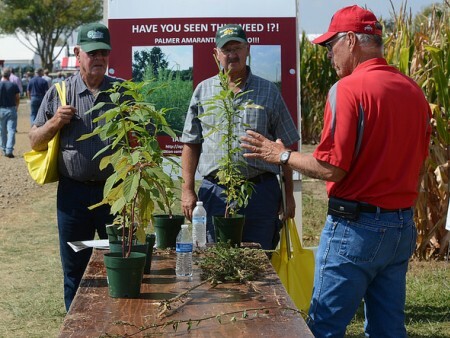 Plot demonstrations by members of the OSU Extension Agronomic Crops Team on corn, soybean, cover crops and bio-energy crops established at the eastern edge of the Review exhibit area. The plots are just outside Gate C near the main entrance gate. Daily field demonstrations in the fields north of Interstate 70. The demonstrations will include corn harvesting, soybean harvesting, tillage, nutrient application, planters and field drainage installation. Live streaming of an unmanned aerial system for real-time crop surveillance. Used as another tool in the farmer’s precision agriculture toolbox, the drones can be used to provide useful local site-specific data including crop scouting and geo-referencing. This allows growers to monitor pesticide dispersion, fertilizer usage and crop health parameters. A building at the corner of Kottman Street and Land Avenue that features 40 new booths with a wide variety of agriculture industry exhibitors, including 20 new exhibitors to the Farm Science Review this year. They include seed, insurance and other agriculture companies. Adding these exhibitors will broaden the show’s breadth of exhibitors, Sullivan said. Advance tickets for the Farm Science Review are $7 at all OSU Extension county offices, many local agribusinesses and online starting in July at fsr.osu.edu/visitors/tickets. Tickets are $10 at the gate. Children 5 and younger are admitted free. Hours are 8 a.m. to 5 p.m. Sept. 20-21 and 8 a.m. to 4 p.m. Sept. 22.